Buy any youth bicycle from us, trikes through our 20" bikes, and receive the full purchase price back when you upgrade to the next size. This works for trikes, 12", 16", and 20" youth bicycles. No matter how long you've had it or the condition, just show us your receipt and we will take the bike back and apply its purchase price as a credit on the next bike. You can use your upgrade discount once at each level all the way to the 24" bikes. When your child is ready to graduate from a 24" to an adult bike we'll offer you our standard trade in option. California sales tax still applies to the original price of each bicycle. Come see us, call us, or email us for more details. Why do we do this? 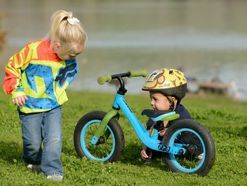 We strongly believe in getting kids on the right size bicycle. When kids are on the right size bike, they have more fun and are more likely to become lifelong cyclists. Plus it gets you coming back! Youth Bicycle Trade-in program credit will be reduced to 50% of purchase price rather than full purchase price. If you have started the program prior to January 2020 you will continue to benefit from the 100% trade-in credit under the agreement you began with up to the 20" bicycles. This change only applies to new program purchase beginning January 2020.